Stainless steel case with a brown leather strap. Fixed stainless steel bezel. Black 'sandwich' dial dial with luminous hands and index hour markers. Arabic numerals mark the 3, 6 and 12 o'clock positions. Dial Type: Analog. Seconds sub-dial at the 9 o'clock position. Hand wind movement with a 56 hour power reserve. Scratch resistant anti-reflective sapphire crystal. Screw down crown. Transparent case back. Case diameter: 45 mm. Case thickness: 13.5 mm. Band width: 24.13 mm. Band length: 9.5 inches. Stainless steel tang clasp. Water resistant at 100 meters / 330 feet. Functions: hours, minutes, small seconds. Dress watch style. Watch label: Swiss Made. 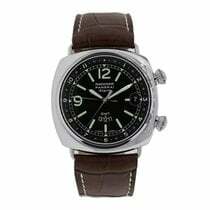 Panerai Radiomir Black Seal Mens Watch PAM00183.